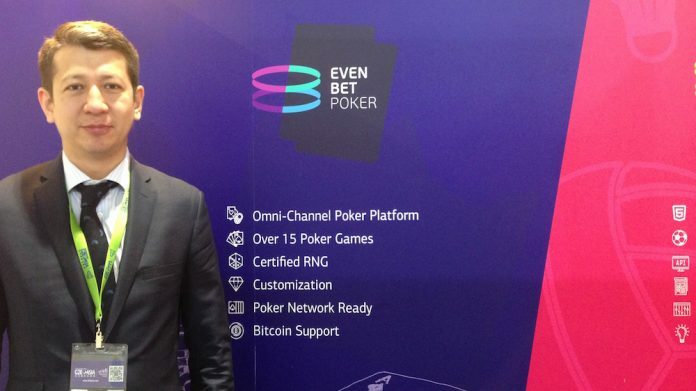 Poker may be a highly contested genre, but for Dmitry Starostenkov CEO of EvenBet, his company’s unrivalled experience developing this niche product makes it an untouchable proposition for operators across every continent. Poker is undergoing a revival at the moment. In today’s competitive gaming environment, firms are increasingly turning to the soft and skill genre as a route to entry for new customers, who can then be cross-sold into high margin products such as slots. But while competition is fierce, EvenBet, finds itself safely positioned between the big global operators who offer “poker as a network”, and a slew of startup software providers that have a lot of catching up to do. EvenBet’s rivals are either operators themselves, like 888, Pokerstars or PartyPoker – “they’ renetworks, so they don’t offer poker as a software themselves – or startups. And having developed his poker product for so long, Starostenkov doesn’t see much of a threat from the latter. “It’s hard for startups to get to this space, because products are pretty complex and its hard to develop it. EvenBet began developing its product in the early days of the internet, 2004, and found considerable success in the US market with a free to play subscription-based poker solution that can operate legally even in gaming’s blackest markets. The soft approach has enabled EvenBet to develop a sophisticated solution isolated from the volatility of regulation. And with Asia on the ascent, the firm sees now as the right time move east, with a newly tailored product, Poker Clubs. “It’s the same poker product but with a slightly different model. Players play in poker clubs, they can create their own clubs and invite other players to them,” he explains. Indonesia, Malaysia and even Thailand are showing demand for the poker clubs model. But with poker itself on the rise again globally, notwithstanding the quick rate of new markets opening up, the opportunities elsewhere are palpable. In the US where momentum for sports betting is carrying with it proposals to open other game categories, Starostenkov feels poker is well placed to benefit. “Poker will have a way in there. It’s a skill game, so it has a less negative perception than other casino games and has more chances to be legalised. Latin America also presents possibilities, especially in Brazil, where poker is already legal.